Fiery sunset along the cliffs in a sunset designed for maximum effect. This is a blend of yak with polwarth and bombyx silk. It's sooo soft and fun to spin! 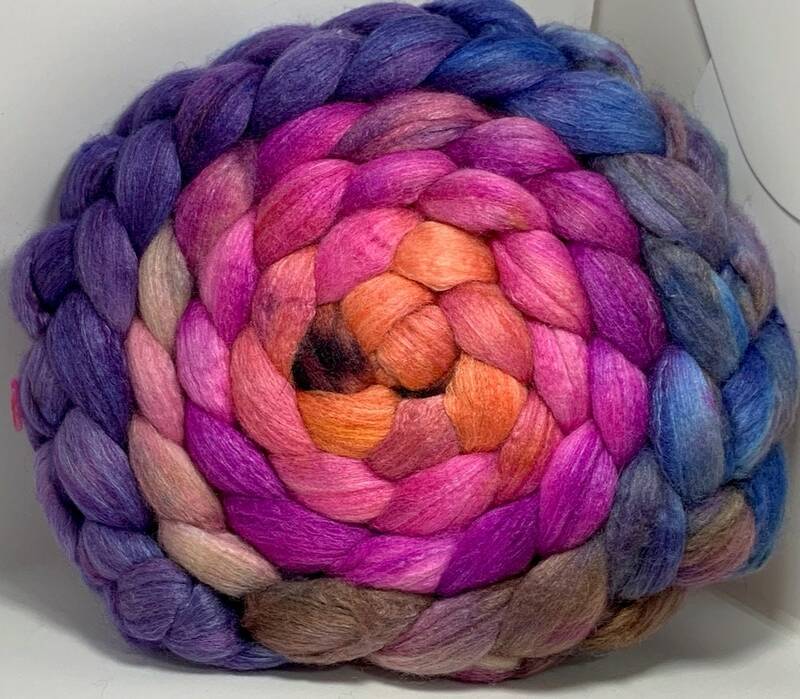 The Fiber and Yarn at Corgi Hill Farm that is hand dyed by me means variations between dyelots done on different days are probable. Please be sure to get enough of each dye lot for your project as future dye lots will be cousins rather than twins. Hand wash cold, line dry with an unscented mild soap. We don't smoke and the Corgi girls don't either but they do shed so there might be the occasional dog hair in your package. If you want extra, just ask! All items listed in the shop are available to ship immediately. We try to accurately photograph each and every product in the shop but please be aware that different devices that you use to view our products may show colors differently. We do not use stock photos on any of our hand dyed fibers and photograph each and every hand dyed braid individually. Your item will be wrapped in tissue paper with a handspun yarn bow and a hand stamped tag. Your message will be hand written on the tag. Beautiful fiber. Thank you for the fast shipping. I bought this as a gift and it is perfect! It's so soft and the colors are beautiful. It arrived in a timely manner and was well packaged. Thanks! Even prettier in person. Shipped really fast. Thank you! Cannot wait to spin this into a nice soft yarn for a knit hat. Thank you again. Give Max and Fiona a pat and scratch for me. It is best to order multiple matching items at the same time so they can be better matched. Custom Orders will be thoroughly discussed so that we are both happy with the process. Matching older braids is off the table, I can come close with a cousin but twins rarely happen from dye lot to dye lot. Yarn and Fiber dyed by Corgi Hill Farm should be washed in cool to warm (not above 90 F or 32C) water with appropriate yarn and/or fiber cleansing products. Do not use very Hot Water. Do not use detergents meant to remove stains (i.e dyes). Do not use heavily salted (i.e. soft) water for your rinsing. All of these measures may damage the fiber or yarn and may affect the color of the product. Heavily scented wool washes have been known to be problematic with hand dyed fiber and make the colors run. Cool water with a soft cloth is best for cleaning most items that are not fiber or yarn. I will happily reserve a listing for you for up to 5 days. if you do not pick up your reserve listing within 48 hours from the end of the reserve date we have agreed upon I will release the item.